The Indigo vat was resurrected using color run remover and we managed to use it again although the items are getting paler and it was getting pretty smelly from the extra chemicals. 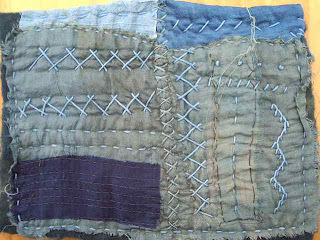 This is a piece I very quickly stitched to see how each fabric would take the dye. Unfortunately my son has taken the best camera off to Taranaki on the school camp with the photos I took yesterday still on it. This sample is made of greenish Japanese silk, wool which had been previously dyed with flax pods (it was pale brown), cream tussah silk, cream silk knit, cotton fabric and cotton sashiko thread, linen thread. I put it through the washing machine when I got home to get rid of the chemical smell. I'd really like to get the strong indigo but had to make do with pale today. On Friday I hope to try the Jacquard indigo kit to see how the price, ease of use, smell, etc compares.